Hi Bo Bunny Blog Hoppers! I hope you are enjoying our second May blog hop! The hop started on the Bo Bunny Blog, so if you didn't start there, make sure you get back there and leave a comment. Leaving a comment there and on each of the design team members blogs will give you 2 chances for winning a prize package from Bo Bunny! And just in case you need it, here is a list with links to all of the designers blog! Each designer will have a link to the next designers blog too, so keep hopping and commenting until you reach the end! All of us have a Bo Bunny project we created especially for this hop and I am sure you will find something to inspire you as you hop along! Here is my project, a layout about Danny and how his dream of having a horse someday has finally come true. He finds such joy and peace working with and being around his buddy, that I knew I had to record this for him! Now, for those of you who have stopped by recently, you might remember me mentioning that you should stop by again soon. Well today is the day! Besides the chance to win a prize from Bo Bunny, you will also have a chance to win something from me! 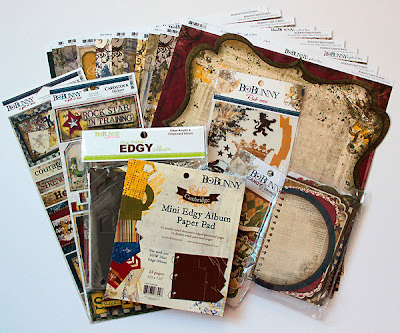 A fabulous Cambridge prize package, including patterned papers, a Mini Edgy Album with the coordinating paper pad, rub ons, stickers and Noteworthy journaling pages! So leave me a comment and let me know what kind of project you would like for me to create in the upcoming month's using Bo Bunny products. It can be a layout, card, altered item, etc. My giveaway is open until next Wednesday, May 25. A winner will be randomly selected from all of those who answer my question and I will announce the winner on Thursday, May 26. Now give me a challenge and Happy Hopping! Wow I am 1st Yikes!!! Julianna any project that you create is just spectacular!!! layouts give me the most inspiration because That is what I do the most of...thanks for a chance to win and have a great day!!! Your LO is gorgeous Juliana!! I love the Cambridge collection as it reminds me of the 7 years I lived in England near Cambridge! I have commited to making more LO's this year then anything else, so I would love to see you keep making LO's to inspire me! What a fantastic page!! Love this line a lot and your page is delicious! Such beautiful rich colours! Your layout is just amazing, so filled with wonderful details. Just stunning! I am so glad I found your blog, I am a new follower and would love to see more layouts, since this is my favorite thing to scrap. Thanks for sharing your wonderful talent! Wow...such an amazing masculine layout...love it! Love your LO... so masculine! In the next months, I would like to see a mini-album, I'm sure it would be amazing! Wondeful project!I would like to see lay outs as i need some new ideas! Way to go! Love your layout! Although, I have to admit that I'm more inspired by mini albums and cards. I am always looking for new card ideas and altered items that would make great teacher gifts. What a handsome cowboy. How awesome to document a "Dream come True". Beautiful LO. Love the embossing and buttons and every little detail. Happy to be a new follower from the Hop! oh, p.s. I would love some inspiration for altered items and I especially love the shabby chic/vintage style! WOWZER on BOTH the AWESOME Layout, and the LOVELY Give-a-way!!! I'd love to see what you will do with the new Zoology BB Line! I love all the details in your layout - and I'd love to see some cards too! I love all the different elements and dimension on this LO. I also enjoyed the inspirational journal note. Very pretty charms. What a generous giveaway. I'd be interested in seeing you create a mini album for a 2-year-old boy. I think the BoBunny would make for a fun mini. Thank you for a double chance to win today! Totally love this layout. The colours, and the swirls are great. I would love to see your take on a little girl's birthday card. TFS!! What a lovely LO! Love the new BoBunny products! I am very curious to all the LO's you will made with these new lines! The layout you have is awesome with all the details incorporated! what a nice Layout and what a nice cowboy. I am now a follower of your blog and look forward to see what you are ceating. fabulous lo and generous giveaway, thanks for the opportunity to win! Gorgeous page! Love how the trinkets add such texture to your page. Not being much of an altered project girl myself, I'd love to see your layout and card creations from BoBunny projects. Thanks for the chance to win! Julianna, your layout is so gorgeous! love how you combined the different lines!! Love how you used Timepiece on a blue background! Awesome! Love the layout! But then again I always love your stuff. :) I would like to see more two page layouts. I have 3 kids and one pagers just don;t give me enough room to include them all. Thanks! this is a great man's layout! I would like for you to create a layout/. Love the colors of this layout, really goes well with the feel of the picture!! I would like to see an altered item next month.. The lo is fantastic, so altered for the next..
Love your layout. The color combos are great. Thanks for the chance to win. I can't wait for any project using the new barefoot & bliss line. Sooo in love with it!! What a FUN photo to scrap with! 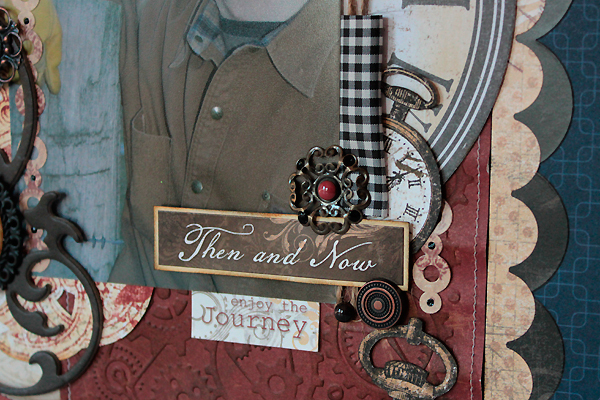 And these papers and embellishments are PERFECT for this! And I can NEVER get enough masculine inspiration! What a wonderful way to highlight such a special thing for your hubby. I really like all of the layering you added to this LO. Lovely! Love the masculine feeling... Classy! Stupendous work. I love everything about this page. This is by far my favorite Bo Bunny collection. I would like to see some double layout ideas. Thanks for the chance. I'm now a follower of your blog and the new cricut blog. Love the layout! Love it all! 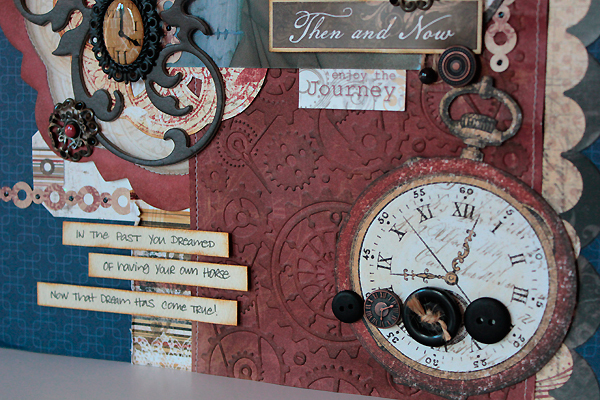 I would probably like to see more scrapbook layouts...Can't get enough inspiration, right? I love how you used your Bo Bunny products to create a layout about a dream come true. I think if you used the TimePiece collection next for another layout about your husband outdoors caring for his horse, it would be a beautiful match. Juliana, This LO is amazing! Love the colors and all of the texture! How amazing! An incredible masculine page. I would love to see some more masculine layouts! I would love to see an altered product made by you. That layout is so masculine and perfect for the picture. Great job. Fabulous page for your guy! I would like to see your take on a mini album as I've been doing lots of them for gifties lately. Thanks for the inspirations! The red paper looks embossed - just like leather. Beautiful western feel to this l/o. Re. your question - I would love to see how a mini-edgy album looks when it's all decked out! What a great layout! It reminds me of those old photos they take in western towns like Jackson Hole! And I love how you grouped it all on that one paper strip! Fabulous! I would love to see a chipboard album with heritage photos....I so want to do one of these! Beautiful LO! I love the colors! I would love to see an altered item, I am just venturing into this arena so any extra inspiration I can get would be great! Stunning LO! Love how you used this collection! Beautiful layout! I have to confess I should scrap my hubby more. Thanks for the chance to win an additional Bo Bunny prize. I'd really love to see altered projects! Great LO with lovely embellishment in clusters which i love. My challenge for you, which i know has been a challenge from before is to create a LO with only paper. No other products with the exception of gloss or ink. I tried this and made paper florishes, fuzzy cuts with gloss. I think i printed my title onto a transparency. Wonderful LO! I love seeing altered items so that's my vote for a project! I enjoyed your layout and the way you have combined product. In the future I would love to see more 2 page layouts. Seems we mostly see just single page layouts but I think many of us scrap double page spreads. Thanks. I love all of the clocks!! They just add that special something to the layout. Thats a hard request - your lo's are amazing - but I love to see altered items - i am always inspired in all the creative ways to use these great papers! how wonderful! i love a giveaway! What a great layout! I love how the blue sky pops against the deep colors of the layout. 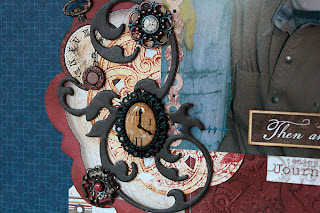 You are obviously a talented scrapbooker, but I would love to see you do an altered box or frame! Juliana...I love the Western but vintage old look. I guess I'm partial because it is so hard to find L/O's w/ that old western flair! We have horses and I'm always taking pics of them and doing L/O's of them w/ my kids roping or just having fun. thanks for sharing. I'd like to see his horse in the next L/O. What a great LO. I like the papers you used. Thanks for the inspiration. And about your question: I would like to see some altered items to get some more inspiration. Very nice masculine layout! Congrats! Beutiful and elegant layout. You are very talented. I really like how the red embossed background looks on your page. I think any project you do will be great but my favorite are double pages so any inspiration on this is always very appreciated. Thanks for the opportunity to win. Love all the embellishments on this layout. I'd love to see Cricut creations to inspire me to use my Cricut more. I love the layout. I have trouble with masculine layouts, this one is very inspirational. I would love to see more masculine layouts, or even an altered item with a masculin theme. I love the masculine layout you did! Love the blue you used for the back ground it really sets everything off and makes the photo stand out! I have only a boy so I'm always looking for male layout inspiration :). I love love to see a 2 page layout male theme with Bo Bunny products. 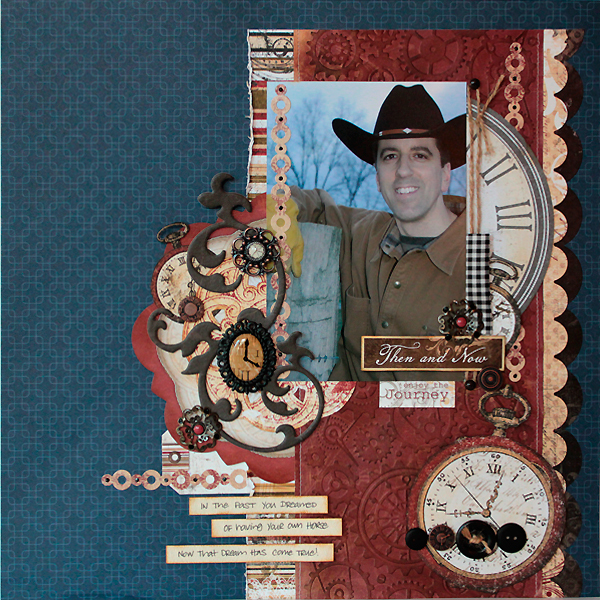 I love this collection and it is perfect for this layout of your husband. It would be awesome if you would create a mini album with Bo Bunny. I can never have enough mini albums. Thanks for the opportunity for a double prize! Such a great layout. Very nice. What a stunning layout! I love the vintagey western feel. Inspiring! for next production, why not a altered box with timepiece collection, to keep all this old photos that we kept from the past?? I'd love to see an altered item. That's one thing I haven't mastered and I always love seeing what others come up with. I'd love to see you work with an altered item. Maybe something for July 4th. What a nice layout. Thanks for the extra chance to win. I would love to see two page layouts as that's what I usually scrap. I love the layouts you do. Today's with the clock and the flourish and how it all flows together is so beautiful. I guess I would just like more layouts. Maybe a two pager? I need some painters tray inspiration, I've had one laying here for a month or so! Great layout! I love the blue and red with brown, the pocketwatch add a perfect embellishment! Would love to see an altered frame, or a quick gift idea to make and keep on hand. Thanks for the chance to win a great prize! Juliana, your layout is quite nice! I like the design and all the elements that you used to make it special! Oh, it would be fun to create a summer layout with lots of bright colors. Thanks for asking!! What a cool LO Juliana great male design! Your work always amazes me!! I love mini albums so I would love to see one of those in the future. Thanks for the opportunity!! Awesome manly lo! I love the vintage look of it, especially for a manly lo. As for your question - I'd love to see lo's and mini albums. Wow, gorgeous layout! Would love to see some ATC's. What a great male layout, this is something I always dtruggle with. In answer to your question, I would like to see some vintage style altered art maybe? Hi Juliana! Stopping by to ask you a question and find myself looking at this super masculine layout!! Great job! ... on to my question: I am a Circle member and would love to know how and with what or using what cartridge did you cut the banner for your oh so gorgeous wreath! I want so bad to lift it! with your blessing, of course! I'd love to see mini's and altered items. I also adore cards!!! I love your layout of Danny! It looks fantastic!! I love everything you make and want to see more of everything.. an altered item, a fun project, a gift card holder card, pretty greeting cards, more layouts!!! I wish more people would make 8.5 x 11 layouts! Oh woow, I love your LO... so masculine! In the next months, I would like to see a mini-album, I love minis!!! Ok, I LOVE this LO!!! I'm all about clean lines, but lots of embellies! Great project!!! I love your layout! It is great to see how Bo Bunny stuff can be used for masculine pages! In the next months I would love to see 2-page 12x12 layouts. There are so many GREAT 1 page ones, but I always do 2! I love the masculine colors in the layout! I'm sure you will have plenty of pictures with a new horse- I think you should do a mini album! What a beautiful layout!! I'm all about filling up my scrapbooks at the moment, so I would LOVE to see more of your layouts!!! I love the Timepiece Collection, it is my favorite, very handsome layout. I would love to see you do a Mini-Album. The papers and your page are just awesome! Beautiful work!